Investigators won't rest until they capture the gunman who ambushed two Pennsylvania State Police troopers outside their barracks, killing one, Gov. Tom Corbett said Monday. Corbett, joined by State Police Commissioner Frank Noonan, spoke briefly at Blooming Grove Baptist Church on Monday afternoon and asked the public to "pray for the soul" of slain Cpl. Bryon K. Dickson II. "I know that on behalf of the state police, nobody's going to let a minute go by that they're not investigating this until we bring this individual, whoever it is, to justice," Corbett said. The governor called Dickson's killing an assassination and planned to meet with family members later Monday. Noonan said the attack Friday night was directed at state police and a "very dangerous, armed criminal" eluded quick capture. 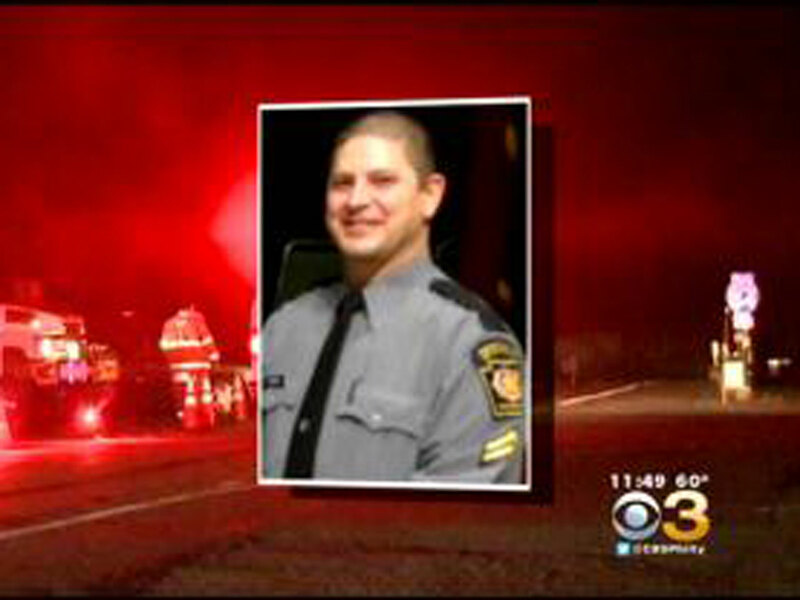 Dickson, 38, was killed and another trooper was critically wounded in the Friday night attack at the Blooming Grove barracks in northeastern Pennsylvania. The killer slipped away. Authorities from three states have been combing the dense forest surrounding the barracks and stopping motorists at checkpoints throughout the area to ask if they saw anything that could help lead to an arrest. "We are receiving a large number of leads, all of which are being followed up. Some are fantastic and some dead ends," Trooper Tom Kelly, a police spokesman, said by email Sunday night. Police released few details about the ambush or the investigation, including the type of weapon used, the number of shots fired, where the shots originated and whether the troopers were able to return fire. Kelly said police were keeping a tight lid on the investigation to "preserve the integrity of the leads." Police planned to hold a news conference later Monday, their first in more than 48 hours. Dickson's funeral will be held Thursday at a Roman Catholic cathedral in Scranton. His wife of 10 years and two young sons survive the Marine Corps veteran, who joined the state police in 2007 and had worked as a patrol unit supervisor in the Blooming Grove barracks since June. The wounded trooper, Alex T. Douglass, a nine-year veteran, was conscious and talking for the first time since he underwent surgery, and investigators planned to interview him. The developments came as a nonprofit group offered a $50,000 reward for tips about the deadly assault at the remote post in northeastern Pennsylvania's Pocono Mountains. Pennsylvania Crime Stoppers, which posted the reward offer, asked anyone with information to call 800-4PA-TIPS or submit the tip online. "This is an assault that was not only just on the individual troopers, it's an assault on the state police, it's an assault on law enforcement, it's an assault on society," Corbett said.